Baldwin has a 60 year legacy of craftsmanship and innovation. Rated #1 in quality by builders and contractors, Baldwin is pleased to offer a line of luxury hardware for the discriminating consumer, our Prestige Series. Feel the difference - Baldwin hardware is solid throughout. With a 60 year legacy of superior style and quality, Baldwin is the choice for an elegant and secure presence. Tobins refined curves and sleek contours are delightful to the eye and pleasing to the touch. The Polished Brass finish adds to the traditional look and feel of the product and makes a classic statement. Both knobs/levers can be locked or unlocked by key on the outside, or turn button on the inside. SmartKey Re-key Technology allows you to control who has access to your home. Re-key the lock yourself in seconds in 3 easy steps. Have you recently moved or had a child lose a key. Its time to re-key. SmartKey provides the highest level of residential security and features BumpGuard to protect against lock bumping. The Schlage Single Cylinder Deadbolt and Keyed Entry Orbit Knob in Satin Chrome is perfect for use on exterior doors, with the deadbolt adding an extra layer of security to the lever. The Orbit knob exemplifies minimalist style with its strong, spherical shape and uncomplicated design, and becomes especially edgy when finished in Satin Chrome. Plus, it's been designed and tested with strength and durability in mind. Prestige Tobin Polished Brass Entry Lever with SmartKey Baldwin has a 60 year legacy of craftsmanship and innovation. Rated #1 in quality by builders and contractors, Baldwin is pleased to offer a line of luxury hardware for the discriminating consumer, our Prestige Series. Feel the difference - Baldwin hardware is solid throughout. With a 60 year legacy of superior style and quality, Baldwin is the choice for an elegant and secure presence. Tobins refined curves and sleek contours are delightful to the eye and pleasing to the touch. The Polished Brass finish adds to the traditional look and feel of the product and makes a classic statement. Both knobs/levers can be locked or unlocked by key on the outside, or turn button on the inside. SmartKey Re-key Technology allows you to control who has access to your home. Re-key the lock yourself in seconds in 3 easy steps. Have you recently moved or had a child lose a key. Its time to re-key. SmartKey provides the highest level of residential security and features BumpGuard to protect against lock bumping. 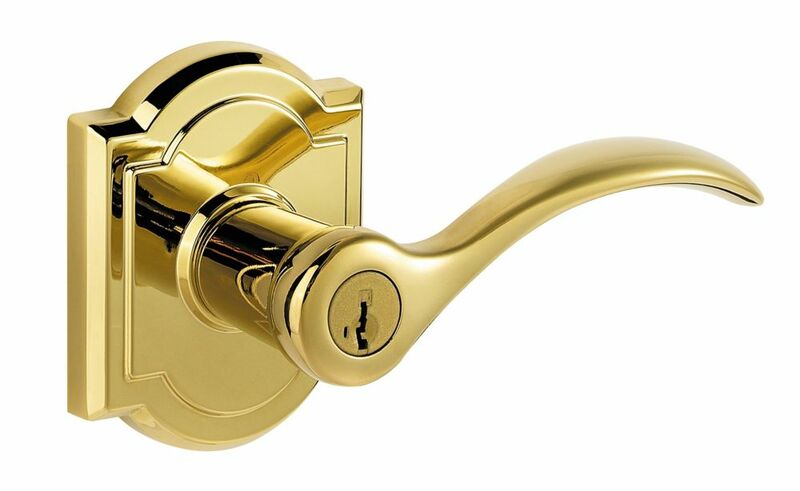 Prestige Tobin Polished Brass Entry Lever with SmartKey is rated 4.8 out of 5 by 16. Rated 5 out of 5 by Franklin43 from Excellent product, easy to install and key, saved me from... Excellent product, easy to install and key, saved me from paying a locksmith. Rated 5 out of 5 by Ladybug from Beautiful!... Beautiful! Rated 5 out of 5 by MarciV from My new Baldwin door knob/lever and deadbolt are beautiful, they... My new Baldwin door knob/lever and deadbolt are beautiful, they work well and were easy to install. We are happy. Rated 5 out of 5 by David from The entry lever feels substantial and well made and it... The entry lever feels substantial and well made and it is beautiful. Rated 5 out of 5 by Al from These are quality solid entry levers.... These are quality solid entry levers. Rated 5 out of 5 by Scott from It is a Baldwin... A first class door locking entry interior doors. I like it because of its nic... It is a Baldwin... A first class door locking entry interior doors. I like it because of its nice look and quality construction.